Apple ripped up its playbook when it launched a smaller phone priced at $399 in March, but its iPhone SE strategy looks to be going as planned. The new four-inch iPhone gave Apple a welcome sales bump in key markets between April and June, according a new report. The second quarter of the year tends to be a relatively slow period for the U.S. firm’s phone sales, but data from Kantar suggests that Apple saw an increase in the U.S. and Europe. Apple’s new phones are unveiled in September each year — the next iPhone will reportedly be unveiled September 7 — so naturally anyone tempted to buy a new device months before may also be tempted to wait. That’s often reflected in quieter periods during Q2 and Q3, but that didn’t happen this time around, and the iPhone SE looks to be the main reason. Indeed, Apple’s overall iPhone sales for the quarter dropped 15 percent year-on-year to 40.4 million units, but it looks like the four-inch iPhone SE prevented a steeper decline. The story was different in some of the most critical smartphone markets. In the U.S., Kantar reported that the iPhone SE accounted for 5.1 percent of smartphone sales. That helped Apple increase its marketshare to 31.8 percent in the quarter, up 1.3 percent on the previous year. For context, the iPhone 6s and iPhone 6s Plus came in top at 15.1 percent, followed by Samsung’s Galaxy S7 and Galaxy S7 Edge on 14.1 percent, according to Kantar’s figures. The iPhone SE’s impact was all the more marked in the U.K., where it was the top selling smartphone with 9.2 percent marketshare, just ahead of the iPhone 6s on 9.1 percent. That helped Apple grow its share of sales in the country by 3.1 percent to 37.2 percent in Q2 2016. 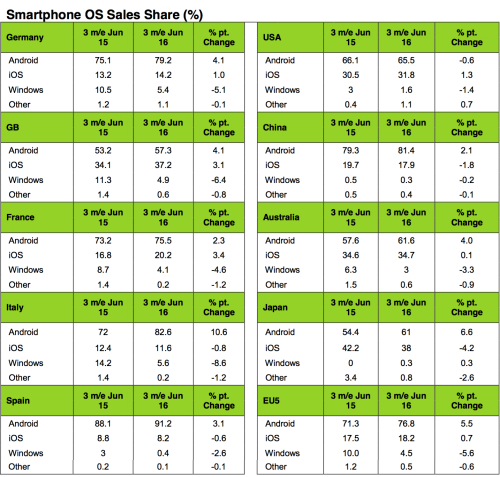 Across Europe, iOS marketshare grew 0.7 percent year-on-year, with particular progress in France (21 percent) and in Germany, where 14.2 percent of all smartphone sales represented growth for Apple for the first time in nine months. The iPhone SE factor didn’t conjure up the same impressive figures in China, where Kantar said the device took just 2.5 percent of sales. The analyst firm said that “supply constraints” had impacted potential sales — additionally, there are fiercely competitive devices at cheaper prices, while it isn’t clear if Apple’s brand cachet resonates as strongly with Chinese consumers when selling non-flagship phones. Proof of the competition? During Q2 2016, local players Huawei and Xiaomi overtook Apple on sales in urban China thanks to sub-$250 devices. Kantar doesn’t track figures for India, which has become a key focus market for Apple, so it isn’t clear just what kind of impact the iPhone SE had there. I previously questioned whether the $399 price was really low enough to make a major splash in India, and I believe that applies to emerging market regions likes Southeast Asia, too. It is sure to complement Apple’s existing products, but unlikely to outshine its top-range devices. Finally, it is worth noting that while the iPhone SE delivered increased marketshare for Apple, there is a financial cost. Apple’s overall gross margin for its most recent quarter dropped to below 38 percent on account of the iPhone SE. Apple, of course, has the highest margins in the business, so it can afford to offset that a little to grow into new demographics and consumer groups that its more expensive products can’t reach. The question is whether the impressive start for the iPhone SE can be sustained, and whether success might lead to other “more affordable” Apple phones in the future.